APSCo was formed in the UK in 2009 with a number of global companies with operations in Australia quickly joining its ranks. Since then, APSCo has gone from strength to strength. It is now a trusted advisor to Government and has earned a strong reputation for providing high quality support services and events. In late 2016, APSCo in Australia was registered as part of APSCo Global with our own elected Directors and registered company, operating independently, but with two seats on the APSCo Global Board and commitment to the broader Global agenda. APSCo is a recognised badge of quality for clients and candidates, with an increasingly international footprint. With independent Associations in the United Kingdom, Germany, Singapore and Australia, and international Memberships available for New Zealand and Hong Kong, each Association operates under a common APSCo Global strategy and direction with locally elected Representative Directors driving strategy and operations to suit local markets. APSCo’s position as the only Membership body dedicated to professional staffing, its strong service offering and international reach means that APSCo is growing rapidly, as professional recruitment firms seek out a distinctive brand that reflects their needs, supports their business and is aligned to unlocking the potential of the modern workforce. • Market education through public policy discussion. • Research and business benchmarking. • Programs and business resources to support business growth and competitive advantage. • Informing the conduct of all Members, and the sector at large, through public policy, knowledge, benchmarking, innovative resources and business and professional standards. • Enforcing the requirements set by the Code of Conduct, Rules, Guidelines and Constitution which govern all Members and, as required, take action when grievances are raised against Member companies or individuals. 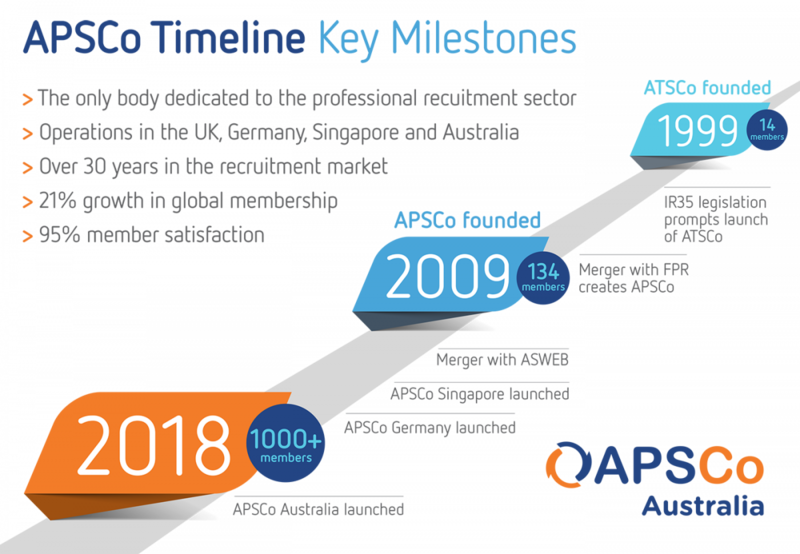 The objective, goals and commitments provide Members of APSCo in Australia a unique opportunity to benefit from the “badge of quality” branding and the professional recognition that has been developed over the history of APSCo’s evolution. APSCo in Australia is managed by an elected voluntary Committee of Directors, made up of senior business executives from Member companies. The Australian Committee is elected by Members bi-annually and meets quarterly. There are local, sector and issues based Committees and Working Groups that also meet regularly. The APSCo Australia Secretariat, led by Managing Director Julie Mills, is based in Melbourne and works to implement the Association’s strategy which is driven by the Members, through the Committees and Working Groups, to the Directors and responds to issues and requests of the Membership and key stakeholders.